With the presidential election only a few days away, the newly formed “Rookie” party led by Carson Wentz and Doug Pederson is holding a substantial lead in all local Delaware Valley polls. Perhaps it’s due to the fact that Wentz provides “hope” for the future and a change at quarterback that “we can believe in”. Perhaps it’s the “temperament” of Eagles campaign manager Doug Pederson or the “experience” of Eagles Secretary of Defense Jim Schwartz. But even good campaigns go through their ups and downs. While Doug Pederson will not be found guilty of using an email server that wasn’t secure, he has been guilty of using running backs that could not secure the football. Last but not least, you have Eagles kick returner Josh Huff, who was caught with guns and marijuana in his car, in a state (NJ) in which he was not licensed to carry a weapon. The Eagles “justice” department responded swiftly, releasing him from the team on Thursday without the need to convene a grand jury to hear all the facts. Then there is the matter of Eagles tight end Zach Ertz, who’s name should probably be changed to “Zach Irks”…since it irks Eagles fans how Zach is always one game away from being one game away from being one game away to having his annual breakout game of the year. Most likely, Ertz will have his breakout game at home against the Cowboys in the last game of the season…but only if it deemed to be meaningless and the Eagles are already out of the playoffs. Otherwise, don’t hold your breath. Last Sunday’s game was maddening for Eagles fans, as for 3 and 1/2 quarters, it looked like the Birds would be tied for the NFC East lead by game’s end. But questionable “campaign strategy” by Doug Pederson, in which he “elected” to have the Eagles play it safe instead of vigorously attacking their opponent, resulted in the Cowboys coming back twice from a ten point deficit in the “polls” to eventually win in overtime. Whenever the Eagles seemed to use a heavy campaign “blitz”, Cowboys quarterback Dak Prescott seemed off his game and was hurried into throwing incompletions. Yet, on Dallas’ game-tying 4th quarter drive and the game winning drive in overtime, Schwartz chose to “tone down the rhetoric” and only used a four man defensive front, which gave Prescott ample time to throw the ball to an open receiver, and eventually win the game. The Eagles 3-0 start gave us some false hope, as two of their three opening wins were against teams that are not going to qualify for the playoff “ballot” (the Browns and Bears, respectively). But the Eagles are still a good team…much better than last year, and the easy opponents of the September “primaries” have been replaced with a grueling stretch which will determine how valid of a “candidate” they really are to win the NFC East. If the Birds had won last week, I thought that this week’s Giants game was ripe for a letdown. But considering the disappointment that the team experienced last Sunday, they will be prepared and focused this week against the G-Men. Birds win 27-21. It won’t be easy…but it never is in the swamp of the Meadowlands where Jimmy Hoffa is supposedly resting in peace. The Last Word(s) – After Chip Kelly’s first two “terms” (years) as coach of the Eagles, we were led to believe that 1) Not only was he a good football coach but that 2) He only believed in drafting character guys for his football team. Knowing now that Kelly failed on both of his “campaign promises” here, I wonder how long it will be till his “constituents” in the Bay Area come to the same realization. 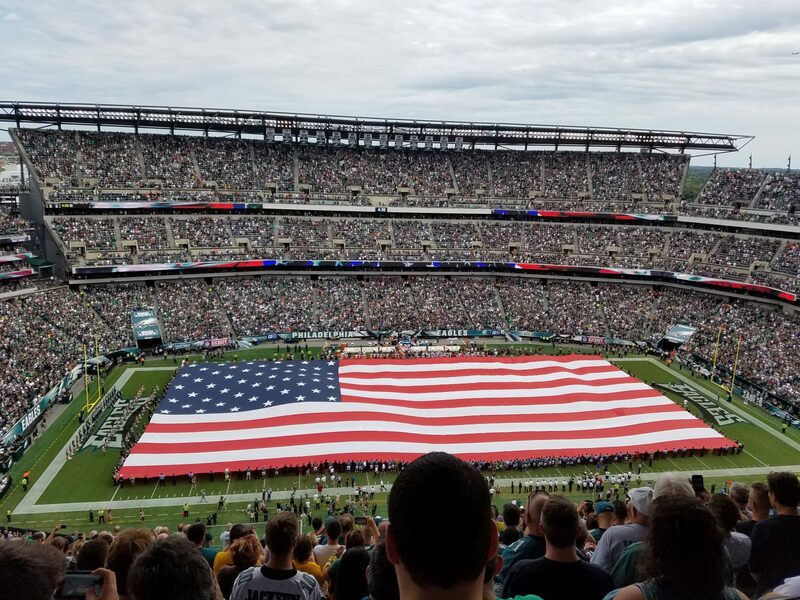 The uneasy feeling that I had while sitting at my seat during last Sunday’s Eagles-Saints game was not due to being out the night before. No, that uneasy feeling was due to watching one Samuel Jacob Bradford, supposed savior of the Eagles football franchise, try to lead his team into the end zone. The Eagles offense actually showed signs of life for a change in the first quarter, as Sam led the Eagles on two long drives. He then culminated those drives by throwing two bad interceptions in the end zone. Both of Sam’s errant throws were the kind that Nick Foles usually makes, but keeping Foles around was not the answer either, as evidenced by Foles throwing four interceptions for the St. Louis Rams on Sunday. Luckily for Sam, and the rest of the offense, the Birds showed signs of life in the 2nd half and handily defeated the Saints 39-17, with yours truly leaving the game with over eight minutes left. But while the Eagles temporarily saved their season and sit at 2-3 in the NFC “Least”, how many times can they continue to struggle in the first half? It’s as if this offense, mentally, is in the parking lot tailgating with the faithful in the 1st quarter and recovering from a headache in the 2nd. Sam’s two 1st half INT’s would have cost the Birds if they were actually playing against a more formidable opponent, but against the Saints, who’s best days with Drew Brees are behind them, they were able to recover and come back. After five games, this team is still an enigma. At times, they have shown flashes of brilliance and can move the ball at will. Other times, this offense looks like it is saddled in traffic on the Schuylkill. Luckily, if the rule of “what goes around comes around” holds true, it might actually benefit the Eagles this season. Last year, the Eagles won ten games but still failed to make the playoffs due to both wildcard teams having a record of 11-5. This season, in the aforementioned “NFC Least”, this team could go 9-7 and make the playoffs as a division winner and possibly win a 1st round game at home. But while the fans would be happy to see Chip’s first playoff victory, the expectations were much more than a “one and done” scenario. But perhaps WIP radio’s Ike Reese had it right. Reese commented that all of the changes the Eagles made before the season would pay off not this season, but in 2016. Ike’s opinion was that next year, when this team has a full season of playing together, would be the year when this offense truly jells and plays to what it is capable of. Personally, I’m fine with that if it happens. Perhaps a winning record and a competitive team in a mediocre division is what our expectations should be for 2015. Let Sam Bradford work out all the kinks now. Let this offense take the whole season to realize that the game does actually START in the 1st quarter and not the 3rd. Perhaps watered down expectations for 2015 is what we should adhere to. And why not? We’ve waited 55 years for a championship – what’s another year or two? This week, the Birds face the Giants in what is a critical contest for supremacy (if you can call it that) in the NFC Least. The Giants eked out a win against a bad 49ers team at home last week, and are a surprising 3-2 on the young season. Injuries have hampered both teams, but being a Monday night game, both teams will want to impress under the lights. Hopefully the Eagles offense will pass on the sausage sandwich and Miller Lite being offered by Gino in Lot K, and actually succeed in scoring some points in the 1st quarter. Don’t tell anyone, but I was actually rooting for the Mets to beat the Dodgers in the NLDS. I know, I know…being from Philadelphia I’m supposed to hate all New “Yawk” teams (and the Cowboys as well), but the Mets put together their team the way that I hope the Phillies do within the next few years….with homegrown talent. The Dodgers, meanwhile, are trying to be the Yankees of the 90’s in my opinion – by buying their way in. Chase Utley and Jimmy Rollins were both major contributors during the Phillies 2007-2011 run, which resulted in one World Series championship and two National League pennants. But Utley’s slide into 2nd base the other night (or better yet, lack of a slide), was a dirty play, and Rollins is stealing money, just as he did with the Phillies during his last few seasons here. Neither Utley or Rollins deserve another championship as far as I’m concerned. There – I said it. As for the NLCS, I’d like to see the Cubs win if only to rid them of their postseason misery. And on the AL side, let the Royals success continue…the Jays can wait another year or two…or twenty.